B. Andrew Barta launched Tech 21 in midtown Manhattan and introduced his unique invention to the world -- the SansAmp. It was, in fact, the culmination of something he simply wanted for his own personal use. As a performing musician with an electronics background, and whose “day job” was repairing, modifying and customizing amplifiers, Andrew had the expertise -- and determination -- to make his vision a reality. Unable to abandon his idea, Andrew had to set out on his own. Although this kind of product had never before existed, it took a surprisingly short amount of time to gain acceptance from players. All they had to do was hear it. Tech 21 pioneered the direct recording movement and created an entirely new category of signal processing. The revolutionary SansAmp tube amplifier emulator was the first device to enable musicians to dial in monster tones and patch them directly to a studio mixer or stage PA. 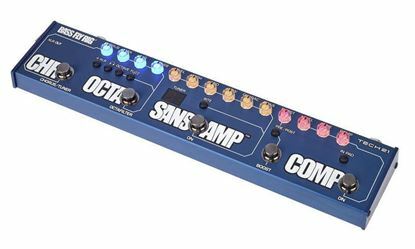 Finally, it was possible to get stunning, consistent tones without futzing for hours and hours to find that elusive ‘sweet spot.’ Instead, the 100% analog SansAmp delivered all of its mammoth sounds from a pocket-sized pedal. Tech 21 continually strives to offer player-friendly, truly useful, flexible, multi-functional, roadworthy, workhorse products. In a world of planned obsolence and constant upgrades, many of our products have changed little, or not at all, and are still in production today. Check out SansAmp and the Tech 21 range at Mega Music. The Tech 21 Bass Fly Rig Bass multi effects pedal gives bass guitarists all the necessities they need for great bass tone in a single, lightweight unit. Gone are the days of needing enourmouse pedal boards. The Bass Fly Rig features five independent sections: boost, chorus, compression, a complete SansAmp, and a powerful Octafilter. There's a built-in tuner for convenience and an XLR output connects directly to a PA system or recording device for when an amp isn't available. The Tech 21 Bass Fly Rig is the answer to massive sound that will fit in the pocket of your guitar bag. Loaded with genuine SansAmp technology and packed with award-winning Tech 21 effects, the all-analog Fly Rig 5 offers a complete pedalboard's worth of stompbox power with extreme grab-and-go convenience. The pedalboard itself is broken down into three parts, but it houses a SansAmp pre, a Boost RVB reverb, a Boost DLA delay, and a Plexi amp-style overdrive with a separate switchable 21dB preamp boost - all for about 1/3 the space of the individual pedals put together! There are plenty of controls on the Fly Rig 5 for tone tweaking, and its robust design makes this all-in-one rig perfect for regular gigging. Tech 21 teamed up with Richie Kotzen of the Winery Dogs to create the Richie Kotzen RK5 Fly Rig effects pedal for electric guitar, and it's ready to be your complete live rig. With Richie's signature OMG overdrive plus delay, reverb, a powerful volume boost, and SansAmp cabinet simulation give you an outstanding sonic toolset for any gig or recording session. Gigging guitarists know that it's not always ideal to bring your full guitar amp rig to every gig. When you need to hit the stage with minimal gear but need a huge sound, grab the Tech 21 Richie Kotzen RK5 Fly Rig. 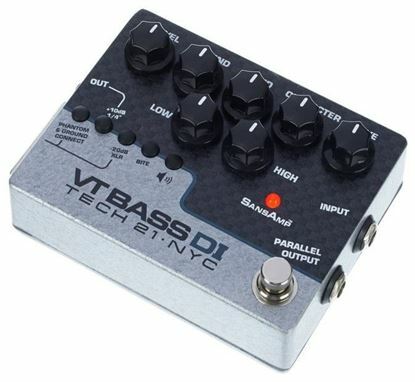 Perfect your bass tone with a Tech 21 SansAmp Bass Driver DI V2 preamp/direct box pedal. 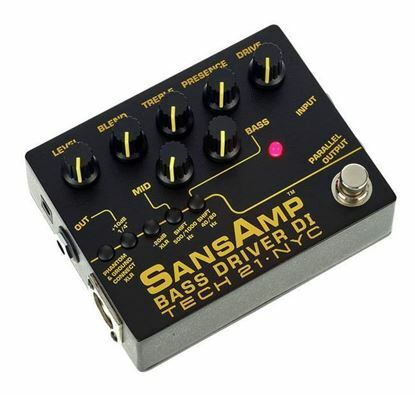 Based on the classic SansAmp bass pedal at the heart of countless live and recording rigs, the SansAmp Bass Driver DI V2 delivers an expanded range of tonal control ideal for modern bass rigs.